Europe Building Materials Market size was worth over USD 85 billion in 2017 and will witness over 5.5% CAGR up to 2024. 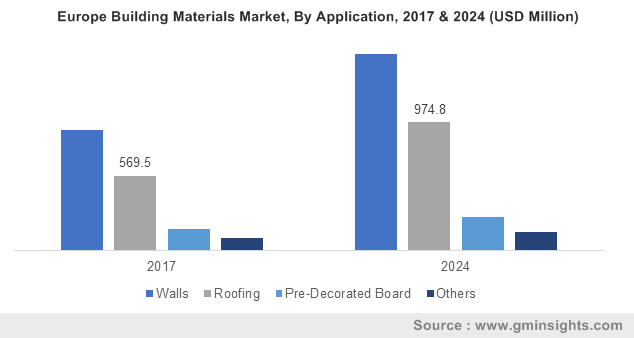 Increasing population, accompanied by rising disposable income has resulted in an expansion in the construction of residential and commercial projects, which will fuel the European building materials market. The housing industry growth is primarily driven by low interest rates offered by the banking sector, encouraging consumers to undertake new residential constructions. A substantial shift in consumer trends pertaining to the modern kitchen, attractive furniture, flooring, and doors & windows is projected to fuel the Europe building materials market growth. Increasing tourist arrivals in the European countries including Germany, France, and Italy, owing to the prominent world’s top tourism destination in the region fuelling demand for the new hotels. Based on the latest statistics, hotel constructions have recorded the highest growth figures from the last decades in the region. Lodging Econometrics (LE) registered new hotel construction pipeline more than 1,388 projects, providing 219,251 rooms in 2018 with over 18% YOY growth. EU policies for buildings have an integrated approach of long-term planning for ensuring excellent sustainability through energy & resource efficiency. To obtain the desired results, policies are being formulated and implemented for newly-built constructions and the renovation of existing buildings. These favorable schemes and government support are anticipated to fuel Europe building materials industry size. Financial support is available from European Structural and Investment (ESI) funds through financial instruments, renovation loans, and grants. ELENA program provides funding with project development assistance by strongly promoting sustainable energy investment programs. Other funding sources include loans provided by the European Investment Bank, the European Bank of Reconstruction and Development, and the European Energy Efficiency Fund. These financially supporting factors providing the vital role in the market expansion through the sales of affordable houses through public schemes strongly supporting Europe building materials industry size. Strong support from the government by introducing favorable policies for the citizens along with the lowering interest rates by the domestic banks positively impacting market development. The UK government has announced an additional grant of USD 12.83 billion to encourage consumer spending on the purchase of housing facilities. Private housing repair & maintenance accounted for a revenue of more than USD 28 billion revenue in 2017. The industry is observing a strong demand for refurbishment activities of existing properties, boosting demand for the building materials in the domestic market. Key challenges are faced by the whole seller, distributors and retailer include, the emergence of e-commerce industry. Shifting huge consumer base towards online channel is hampering major profit share of the various distributors and retail outlets. Manufacturers are adopting a direct selling strategy to gain maximum profit margin by trading directly with the building contractors. The region has witnessed a fall in skilled workers after the economic crises. European Centre for the Development of Vocational Training reported more than four out of ten businesses in the EU have faced similar problems, reducing the competitiveness in the industry. Consistent resourcing of skilled labor is limited, thus restraining the production output. Lumber generated over USD 70 billion revenue in 2017. Lumber or timber has become an essential material among other products due to its excellent mechanical characteristics. It is essential to attain the FSC-certification, as these labelling offers product performance guarantee. Hardwood and softwood are the basic types used in the construction market for excellent structural forming. 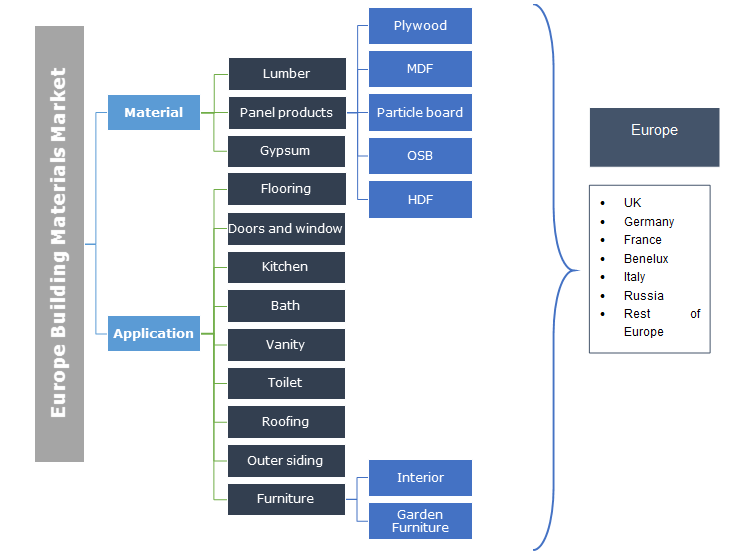 Lumber components are widely used in making and framing structures of housing roofs, furniture, and the outer basic structure mainly fuelling Europe building materials market size. Panel products market is anticipated to register more than 6.5% CAGR up to 2024. Wood panel products contain significant portions of wood varieties crafted into veneers, sheets, chips, fibers, and strands. The increasing demand for wood-based panel products owing to the exceptional stability & uniformity and utilities in a wide variety of applications are boosting the demand. The panels are widely used in making artistic and decorative doors, windows, furniture, kitchen cabinets. Furniture application was worth more than USD 35 billion in 2017. This segment is a combination of indoor and outdoor products including tables, chairs, beds, storage, and cabinets. The wooden furniture market is projected to witness high demand owing to the increasing consumer preference for authentic as well as modern architectural designs. The outdoor furniture market holds strong potential in commercial spaces such as hotels, resorts, and restaurants. Increasing demand for luxury & high-end modular furniture supported by the innovative designs is propelling the business demand from the building materials applications. Door & window application is expected to witness over 5.5% growth from 2018 to 2024. Doors & windows are the key components of a residential or commercial building to provide enough ventilation and the light inside. The product has an availability of numerous colors, laminates, and varied patterns driving the segment growth. Increasing demand for products, resistance to weathering, termites, and a high impact will drive the industry growth. UK building materials market contributed more than USD 8.5 billion revenue in 2017. Construction spending in the private housing sector recorded high figures of more than USD 42 billion revenue in 2017. UK reported the GDP growth of around 1.8% in 2017 and 1.9% in 2016. The construction of private housing growth is expected to maintain the demand for new residential structures due to the government’s initiative, Help to Buy equity loan up to 2021. Growing renovation activities and new residential construction due to rising population and increasing the count of migrants will influence the country growth. Germany building materials market is projected to witness more than 5.4% CAGR from 2018 to 2024. German construction companies have turned to foreign markets to compensate losses in the past period of crises. In 2016, the Germany construction sector accounted for the turnover of international revenue more than USD 28.18 billion from the outer EU market. German construction companies are strengthening market position by capturing the international market from more than 70 countries. Europe building materials market share is fragmented in nature due to the presence of small and large companies in the market. The major companies are BASF SE, James Burrell, and Saint Gobain. Other prominent companies including Gyproc Iberica, Siniat, Fassa Srl, UPM Plywood, Danzer, Kastamonu, PCI Augsburg, Puumerkki, Murdock Builders Merchants and Bituline Industries are key players in the market. The numerous companies are involved in the partnerships and collaborations to support their industry footprint. To capture a larger industry share, the companies are anticipated to develop their supply chain network in the region. The new entrant will surge steadily due to high-profit margins in the Europe building materials market over the forecast timeframe. The manufacturers directly supply their products to customers or end-use application industry. However, expansion initiatives by top companies have empowered the third-party distributors. The industry has an existence of many players engaged in the production of a wide range of products supporting Europe building materials market share. According to a study conducted by the Malaysian CIDB in 2017, the cost of materials represents nearly 65% of the total building cost. Online sales have emerged as the fastest growing distribution channel for building materials in Europe, particularly for individuals and small-scale companies & service providers. It comprises elements such as concrete, sand, lumber, gypsum, panel products, rocks which are utilized in several construction applications. The surging adoption of a sustainable infrastructure along with the higher use of eco-friendly materials including lumber, plywood, particleboard, and gypsum is boosting the application profile. These integrated and long-term sustainability goals are projected to boost the building materials market over the forecast timeframe.